One of the features we knew we wanted to add soon when we launched was the Queue, and we were so excited to roll it out last week! If you're familiar with the queue functionality on Ravelry, this is similar but with some important differences, most notably that your queue will display both patterns you've queued and any "active" projects you're working on. Essentially anything you're planning to work on or currently working on will show up - it behaves as a complete to-do list, as we know it's common to work on multiple projects at once and struggle with staying organized! If you have active projects you want to show in your queue from before it existed, you'll just need to edit and re-save them before they'll show up. Any new active projects created from here on will be added to your queue automatically. If you want to remove a project from your queue, you'll need to set it to either "set aside for now" or "all finished!" as its project status, then it will only show up on your Projects page. To add a pattern to your queue, just click the little "queue" icon next to the "favorite" heart. 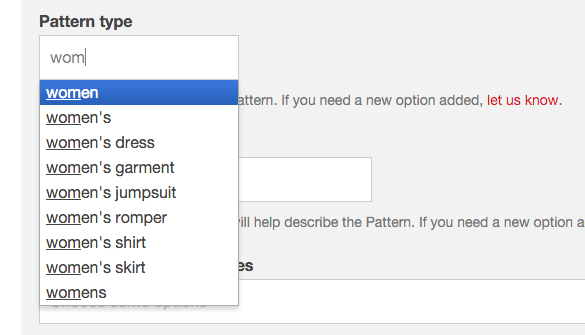 To remove a pattern, either click the "queue" icon on the pattern again, or on your Queue page, click the red "x" at the right of the pattern's info. Once a pattern is in your queue, it'll indicate it if you already have the pattern in your stash, so you know whether you still need to purchase it before starting to work on it. 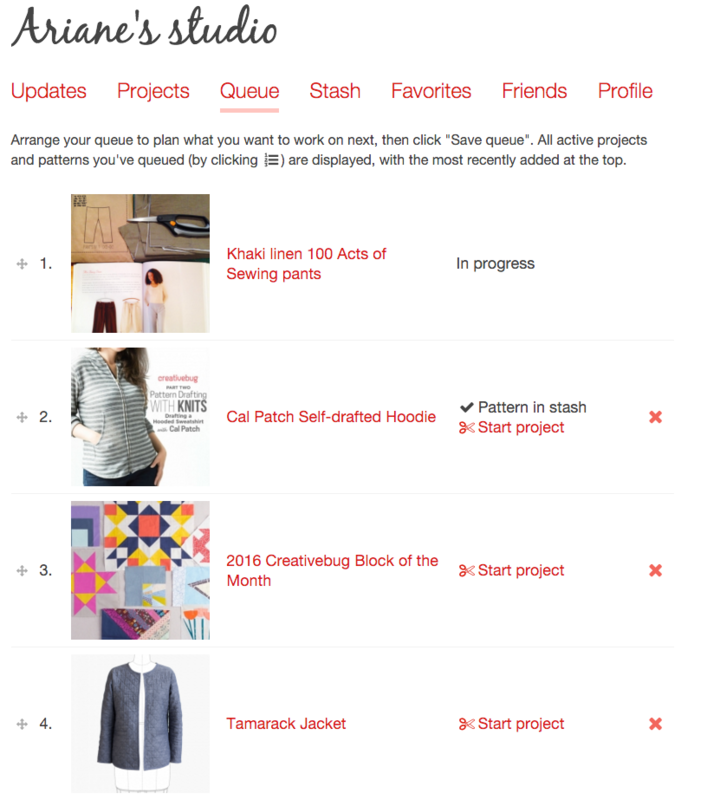 When you're ready to start working on a pattern in your queue, click the "Start project" link and you'll be prompted to create a new project which will then take its place in your queue when you save it. When you do this, you can record which fabric you're using and other details. 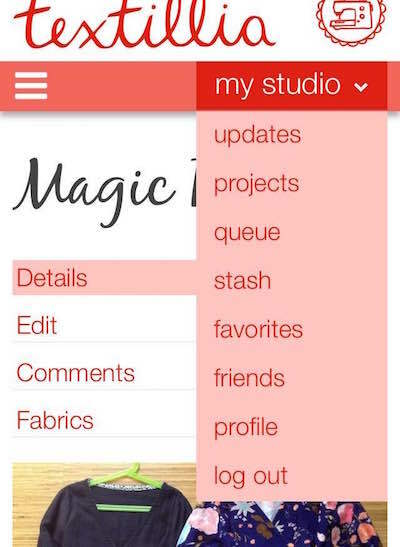 When a new project or pattern is added to your queue, it'll show at the top of the page. To move it, just click and hold to grab the arrows icon to the left of the photo, and then drag it up or down and release it in its new place. Once you have things in the order you want, click "Save queue" at the bottom of your queue page and you're done! Lastly, just a note that your queue is visible to other members, thought it was worth mentioning for those who like to do secret sewing! If you have any other questions, feel free to post in the comments below or in the forums. One thing to note is you can't currently reorder your queue on mobile devices (like your smart phone), but you can add items to your queue on mobile, and then reorder them once you are on your laptop/desktop again. There are two great new pieces of functionality in the forums - the new tabs on the main page and the ability to attach photos to comments. Unanswered topics: which are threads with no replies yet - a great way to keep an eye out for people looking for help who haven't been responded to! You can also filter each page by specific forum areas (which will become more important as the forums become more active). We've also added the ability to attach photos to forum comments (in addition to the existing ability to add them to the initial post of each thread). It works just like a regular image upload and the photos are posted full-size in the thread. This is super handy if you are working on a project and need some feedback or help! Many of you were plagued by your photos uploading sideways. This was caused by faulty orientation data in the image file that comes from some phones and cameras (especially older ones), but we're now able to correct the vast majority of sideways photos automatically. Yay! If the automatic rotation doesn't work, you'll still have to rotate it manually before uploading, but this should be a very rare occurrence now and the majority of existing photos have been automatically corrected. You can now delete your own projects, for example if you accidentally upload the same project twice or for any other reason. 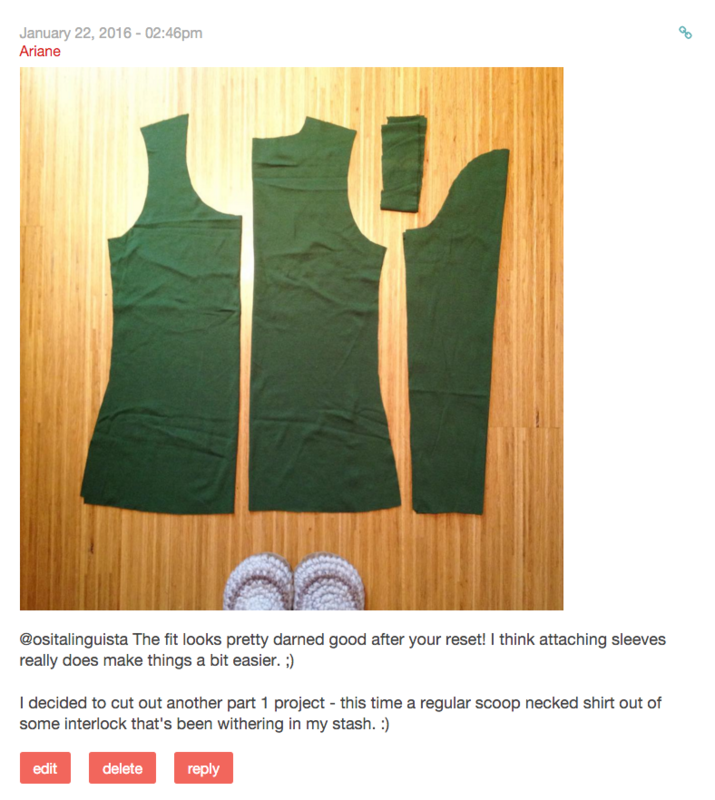 Just note that the project, its images, and its comments will be permanently deleted. You'll notice now that several of the category fields that were previously "free-tagging" (i.e. you could enter new categories yourself) are now just "select" fields. These are easier to use as they don't require the comma separation, and more importantly it helps help decrease the number of duplicate categories and typos, for e.g. "women", "women's", and "womens" will all get combined into a single option. I'm working my way through cleaning up and merging categories, which will be ongoing for a while, but then they'll be all neat and tidy and much easier to enter and search. We've left a couple of the more broad categories in "free-tagging" mode for now, as we know there are still more options to add before we have a near complete set. For the rest, if you discover an option missing that you need, there's a link in the help text to this forum thread where you can post and I'll get them added in a jiffy! Bruno has been working on improving the mobile theme so that Textillia works better on tablets and phones! I know this is exciting for a lot of us, especially when we want to browse patterns or take photos on our phones and directly upload them onto our projects. You'll notice very few changes on the desktop/laptop version of the site (such as now you have to click once to open the menu rather than hover), but a lot of changes on the mobile version. The layouts, links, and menus will all start looking more like what you're used to on modern mobile-enabled websites, and more parts of the site that were broken before will start to work on touchscreens! If you are having any major issues using parts of Textillia on mobile devices, you can report issues in our Bugs reports forum. That's it for this update - we've got lots more planned for 2016, so stay tuned!